Nobody's at home on Park Avenue. Envious? You bet. Lots of houses. Can we please let these guys off the hook? Truly ridiculous. America has asked David Petraeus to walk into a burning barn and perform brain surgery on a dying patient. If it can be done, David Petraeus is our man. The odds are against him. A man can have sexual pleasure from a child as young as a baby. However, he should not penetrate. If he penetrates and the child is harmed then he should be responsible for her subsistence all her life. This girl, however would not count as one of his four permanent wives. The man will not be eligible to marry the girl's sister. So Rudy's campaign is essentially about arguing over which�question voters should�use as�the criteria for making their decision.� If he wins that argument, the question of whom to vote for starts to favor him a bit. In politics, the question is�more important than the answer. 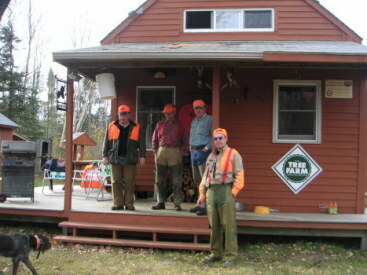 Image: a couple of Maggie's Farmers and friends at the end of grouse season. Now the trick is to stay alive until the next one. I may be a Southerner by heritage but I would vote for Rudy. I'd like to see his second be Newt. They're both smart and both believe that defending the country comes first. He showed his gravitas in spades on 9-11 and in the days and weeks following that attack. He doesn't grind people the wrong way, that'll be Newt's job who I've never seen bested in a debate. the man knows his history and the reasons why things are and the way they aren't. Since the era of Scoop Jackson the Democrats have really been without an HONEST voice for the defense of the country and that is ashame because we need a viable two party system who at least have commonality on defending the nation. As we look back to the Jimma Carter years we can see just how much damage four years of Democratic Party full control of government can do. However I understand in California their are teenage single girls who are announcing that their not yet conceived and unborn children are already filing papers to run for the WH. Park Avenue and Carmel. "stratespherically rich" future playgrounds. Those rich would be the ones like MIcheal Milken, Ivan Boskey,Bernie Evers, Late Ken Lay ...of course Milken only spent a wee bit of time in jail and still got to keep something on the order of 800 million dollars. I here to tell ya, I volunteer for two to five in Club Fed for 800 million.. It would be nice if I weren't such a cynic about Wall Street but having been in that business for almost twenty years ( the DOW was around 1500 when I started) and having worked in Beverly Hills for three years for IBM I can't shake the cynicism ... the "stratespherically rich" believe in their souls that they deserve what they have and more. They believe i their imperious nature that the land between LA and New York is just "THE GREAT FLYOVER". I'm all for capitalism but the fraud and deceit costs the average investor more than they will ever know. Gonna be a weak mkt tomorrow--better duck. The Putin remarks give nerves an excuse to take profits. Is that a blue tic, in the left foreground? ABOUT HOLLYWOOD, JOE McCARTHY, AND HOLLYWOODS PROBLEM WITH AMERICA TODAY. The Left and particularly Hollywood love to cry McCartheism any time there is an investigation of collusion between Hollywood nad the commies or soon the Islams. WellJoe McCarthy was abrasive in his hearings but he was dead on right in his information..so the blacklisting took place in H-wood. The attached article will provide the individual who doesn't understand why Hollywood hates America with some greater understanding. Funny you should mention Milken. A piece coming up on that very subject today. I happen to think Milken was innocent, and screwed by Rudy. I always tend to feel delight when people make a lot of money - that freedom is a wonderful thing, if it's what you want to do. Donald Luskin was just saying the same thing recently. That he had a problem with the Rudy candidacy for that very reason. Differences of opinion. That's what makes horse races. Milken had a trial, guilty they said. Milken kept hundreds of millions of dollars, hundreds of millions. Many are satisfied to say he was scapegoated, charged with minor infractions for political purposes. Well, they prosecuted Al Capone for income tax evasion. Capones' business card read "Second hand furniture dealer"
Often times a prosecutor knows that the complexity of the case will not allow for a conviction so they either plea bargain or go for lesser offenses. Rudy chose to go with the latter. Emotions are great things, like feeling "good" when people make money. Wall Street counts on two pillars of "emotions from the average investor, fear and greed, you hear it as a mantra. I have seen brokers who churned accounts using those"emotions" that could turn water into butter. So my delight in seeing people make money is in seeing then make it honestly. Most of the Wall Street firms make huge amounts of money so illegally, in such complicated manners that prosecution is impossible. Just read Wall Stree reporters' Charles Gasparino's book, "Blood on the Street"
Another eye opener is "When Genius Failed: The Rise and Fall of Long-Term Capital Management " the hedge fund that wall street investors and US taxpayers had to bail out even though it was run by two winners of the Nobel Prize in Economics. The list is already long and distinguished on Wall Street manipulation,payoffs and theivery from the average investors pocket book, and I am more than confident that we see only the tip of the iceberg. Yeah, Wille Sutton and D.B. Cooper made money too they just weren't as subtle about it. Mr. Milken the court finds you guilty. When George Soros was called before Congress to testify about "his" most knowledgeable area of expertise, hedge funds, his response when asked how they worked was that he couldn't explain it. Now he's on record as having sworn he can't explain what he does. If ever prosecuted, a bad memory and that statement before Congress is a free ticket out of jail, unless they nail him on income tax evasion. The people at the top of Wall Street are more devious that you can ever imagine ...but they can always count on fear and greed to propel the machine. It is an oxymoron to put making money on Wall Street and honesty in the same sentence.